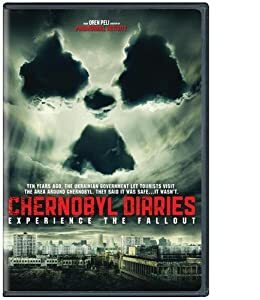 Official Description: Six tourists hire an extreme tour guide who takes them to the abandoned city Pripyat, the former home to the workers of the Chernobyl nuclear reactor. During their exploration, they soon discover they are not alone. Unofficial Description: Hey! You know what would be cool to do as tourists? Visit the site of the worst nuclear disaster in Europe! Nothing weird could possibly happen there! I thought this movie had an interesting premise and trailer, which is why I decided to watch it one night. It was okay, not great. Just okay. From the same people who brought us Paranormal Activity (which I enjoyed immensely), this movie mixes your standard scripted horror fare with some very small found footage snippets. As far as that goes, they mix the two well enough and the found footage scenes do not annoy or take away from the ‘scripted’ scenes. Nor does the ‘shaky cam’ style of shooting distract the way it has in other movies. Here, it’s toned down quite a lot. The twists and turns were not surprising, though the main plot twist of what was really going on was not what I expected at all, which is good. I like it when they can toss me a curve ball now and then. Overall, a decent horror flick, but a little long for my taste. I think they could have easily shaved 15 mins and still told the story they wanted to tell. Weirdly i just did the tour of Pripyat on Monday. It is a very strange place to do tourism!